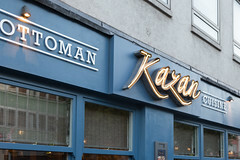 A lot of good Turkish restaurants range all the way from takeaway joints, to informal mezze bars, to fairly elaborate dining rooms, and Kazan is definitely on the elaborate end of the spectrum, with several rather nicely appointed dining rooms, nice decor, and well-dressed waitstaff. Menu-wise, it’s a combination of set menus (some obviously aimed at the pre-theatre crowd) and a la carte, and we opted to do the latter, getting a reasonable selection of mezzes and main dishes. 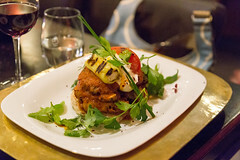 The mezzes were brought out rather quickly, and we ended up with a really good assortment of dishes. 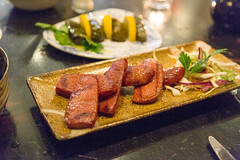 Their Turkish sausage was a very flavorful and peppery sausage served up grilled on a simple platter. 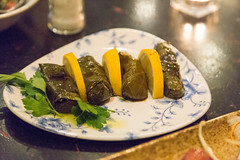 The dolma (stuffed grape leaves) were particularly nice: moist little packets of meat and rice with a nice lemony grape leaf wrapper. While I’m usually not much of a fan of baba ganoush, the version here was very good, with a nice smokiness, a smooth texture, and a lot of lemon and garlic. And the tabbouleh was a particularly nice rendition of a classic dish, having some quinoa and pomegranate mixed in along with a nice amount of mint and tomato, I’d love to get some more of this. And the hummus was a smooth creamy variety with both chickpeas and tahini, with a rather strong garlic component. Aside from the tabbouleh, these were basically straightforward renditions of Middle-Eastern classics, but executed quite nicely. 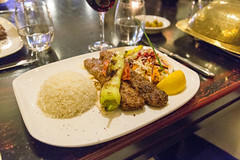 For my main course, I chose a lamb adana kofte: a mince of lamb with more than a little red chile pepper and onion mixed in and grilled to order. I always love this style of kebab, and the kofte was perfectly done: a nice crisp from the grill all around, some good smoky flavor, and the onion and pepper just starting to break down and perfuse through the meat. Add in a nicely roasted pepper (there’s just something great about the way Turkish places can grill a pepper), and this was an excellent dinner. Carol opted for the more elaborate Kazan Special, a nicely presented layered construction with charcoal-grilled chicken, lamb shish kebab and both lamb and chicken kofte layered over Turkish bread , topped with a salad, and served with yogurt and tomatoes sauces. Quite a feast, and it had just enough of both chicken and lamb to give a good overall flavor. Overall, I’m really happy we had a chance to finally experience Kazan. 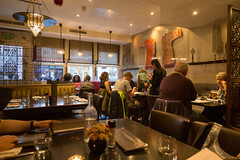 The restaurant is nicely appointed, the staff quite pleasant, and the food very nicely executed. I’d love coming back and try out some more of their grilled dishes.